Cocavo is carefully infused with cilantro, lime and a hint of ginger, giving you a mouthwatering combination. Cocavo enhances and brings out the flavors in spicy Thai and Indonesian dishes. 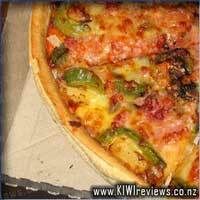 It is ideal for vegans, vegetarians and non-vegetarians. I was so excited to be able to try the Cocavo - Coriander, Lime and Ginger. I love being able to include healthy fats in my cooking with coconut oil and extra virgin olive oils taking pride of place in my pantry. So when I saw this Cocavo oil infused with these great flavours I thought it could be a great way to add flavour to my stir frys. As I do with any new food, before opening I read the nutritional information on the container. I was pleasantly surprised, 0g carbs, sugars, sodium and some good poly/monounsaturated fats. The ingredient list contained no hidden surprises just the oils mentioned on the front of the container. I also noticed the dairy and gluten free tag meaning its suitable for my lactose intolerant child. The serving size is stated as 1 tablespoon (14g). So far everything is looking great. On opening the container it was an interesting smell. Not what I was expecting but then I&apos;m not sure what I was expecting. I put the tablespoon of oil into the pan and warmed. It heated well, didn&apos;t smoke or anything like that. I tipped in my vegetables and cooked away. I dished up and eagerly went to try. 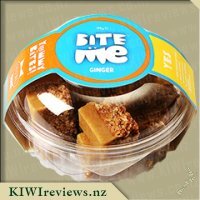 The flavour was ok. Didn&apos;t find it too strong but could taste the ginger more than anything else. I found the vegetables pleasant to eat. The kids on the other hand we not so keen on the flavour with both only eating one mouthful. Overall I thought the Cocavo - Coriander, Lime and Ginger was a pleasant flavour addition to my vegetable stir fry. It will be great for a light meal. 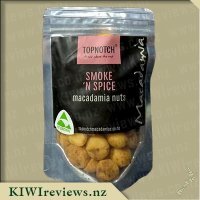 I&apos;m not sure if I will be able to use the whole 400g within the 3 months from opening and with the price of $13.50 it more than likely won&apos;t end up as a staple in my pantry just because I&apos;m not too sure of many other uses for this flavour. After having tried the Cocavo Chilli and lime oil I was immediately impressed with its taste addition to meals and looked forward to trying more of the Cocavo flavours but after having the coriander, lime and ginger one I am left a little bit disappointed. On paper, this flavour would have been the one I thought would taste the best but in reality, I couldn&apos;t see any of the others tasting worse. My partner made a stir-fry for lunch to begin with using the oil and even while it was cooking it put off a weird odour that was hard to describe what it was from. After she served it up it was hard to eat through the meal without getting a strange almost metallic taste from the flavours and thought it might be possibly something else in the meal giving off the weird taste so decided to use it again for dinner with completely different ingredients. For dinner, we cooked up pork strips using the oil trying to only use one ingredient to see how the flavours paired and trying to minimise conflicting ingredients to see how this oil would taste but again it was the same story with the oil itself burning off a weird odour and when eating the pork although this time being more tolerable the metallic taste was still there. Going forward I think this oil may work well in spicy dishes where the heat could mask the taste of the oil but I can&apos;t bring myself to using it on dishes I love knowing how it would possibly taint the flavour too much. 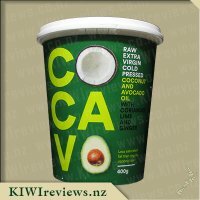 I haven&apos;t given up on Cacavo at all as I love the Chilli and lime flavoured oil and will defiantly try their other flavours hoping they can redeem themselves again but I wouldn&apos;t ever purchase this Coriander lime and ginger one unless I stumble onto something miraculously that this can work with. This is interesting as for the first time I read other peoples thoughts on the oil before I tried it myself which I do not do but I was interested to see what people had to say and there were some mixed reviews. How ever for myself when I opened the pot I could smell the lime straightaway. Which was nice as I love lime and I also love ginger and coriander so I was really interested to see how well these flavours came out in the oil. I decided to use this oil to cook with a stir fry to start with. 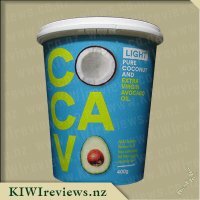 I am currently doing keto so this worked well as you can use coconut oil to cook with and the oil has 0 sugars. I put a table spoon into the pan and it melted away. I added my chicken and veges and cooked them up. I tried some and I thought it tasted nice. The lime flavour was the strongest for me which I wish it had more coriander as its my favorite. How ever I could taste the ginger and coriander mildly throughout the stir fry. It was yummy though and worked well with my eating plan. I noticed the pot has to be used within 3 months of opening which would be ok while I am on the keto eating and use oil a lot with cooking but if I wasn&apos;t on keto I am not sure I would use it all by 3 months which would be a waste. Overall its a ok product and at this point of time I probably would buy it again as it works well with keto coking. I love the pot colours and it matches with the ingredients with the green pot. I have tried a couple other flavours and noticed they match the colours to the ingredients used. I&apos;m someone who enjoys using coriander in my cooking now and then, I like lime and ginger in the right context is fabulous (I&apos;m looking at you L&P dry ginger beer), but I have only had the three combined in a singular meal once before, many many years ago and none since because back when I tried it I found the combination tasted horribly, but tastes change over the years and I was glad to give this a go. As with their products, what&apos;s listed on the label is what you get, nothing hidden, this oil is a mix of avocado, coconut, lime, ginger and coriander oils and has the lovely pale green colour of the avocado. Opening it up I have it a sniff and I have to say that I didn&apos;t like the smell of it at all, something about it was just a little off and made me feel a little nauseous, so I popped it back on the shelf and came back to it after a few days. A little goes a long way, so this pot of 400 grams could last you a good while (3 months from opening before you&apos;d need to chuck it). I used this to cook some falafel patties in and found that it didn&apos;t really add anything to the taste that had me thinking I simply had to use it again. 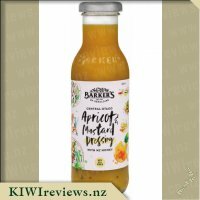 I also used this in a simple stir fry rice and in a noodle stir fry but in both situations I wasn&apos;t really liking the effect this had on it. I&apos;ve struggle with enjoying this one and I shan&apos;t be buying this. I am a big fan of cooking with coconut oil in my everyday cooking and also in my baking. I really liked the idea of a flavoured oil especially one that claims to have less saturated fat than normal coconut oil. This Cocavo product is made from extra virgin coconut oil and extra virgin avocado oil with coriander, ginger and lime oil added. The container is 400 grams with 28 servings in it. My container has a best before date more than two years away but once this product is open it should be consumed within three months. In hindsight I wished I had gone for a different flavour (or even no flavour) as a coriander, lime and ginger flavour automatically limits its uses to cooking rather than baking. 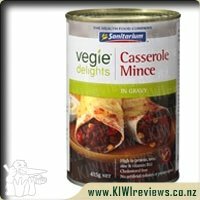 I decided that this would be good in stir fries and curries so firstly tried it with stir fried vegetables. This was not a success. I ate the vegetables not enjoying them at all and then felt quite sick all night. The after taste I think maybe of the avocado more than the coconut but I can&apos;t be sure did not sit well with me at all. It took me a good week or more to summon up the will to try this again. This time I stir fried some rice and vegetables together with the same out come. With only five ingredients I am not sure what it is that doesn&apos;t sit with me but this really had me feeling most unwell. 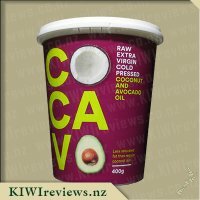 I think to be fair to the product I should probably try an unflavoured one as I can&apos;t say for sure if its the combination of the coconut and avocado or if it was the flavouring oils that haven&apos;t sat well with me. 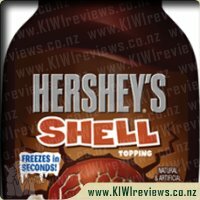 I do like the idea of this product but unfortunately this flavour was not for me and I won&apos;t be trying this again. I have been known to add too much coriander to my cooking because I like it so much - so when I opened this pot for the first time I expected to be hit by that characteristic aroma. I was disappointed however as there was very little coriander smell at all. But all that changed when I put a small knob into a pan and turned up the heat. All of a sudden, the kitchen was full of the most amazing spicy aromas of coriander and lime: I was instantly extremely hungry and could not wait to add the food to the heating oil! 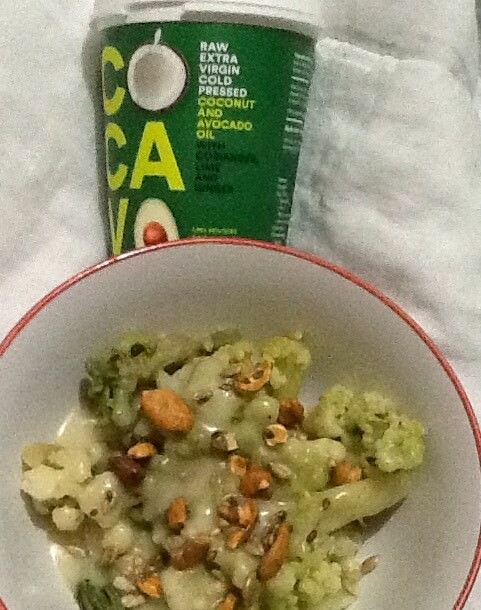 I was planning to prepare a broccoli and cauliflower bake, something I usually serve with a light cheese sauce. This time I went for a plain white sauce incorporating the Cocavo infused oil instead of butter. I prepared it in exactly the same way, adding flour to the warm oil in the pan and then stirring in plain soy milk until it thickened. The cooking process was easier in fact; there were no lumps to deal with, and there were none of those odd flecks of brown that can creep in when you have the butter and flour mix too hot. Once it was ready, I tried it before adding it to the vegetables. It tasted delicious but was not quite salty enough even for me - probably because, unlike butter, this oil is salt free - so I added half a teaspoon of Raptor Rubs Vegie Salt Sprinkle; that then balanced out the flavour beautifully. I finished off the dish with a sprinkling of chopped nuts. The result was so delicious that, although I had prepared enough for four people, the two of us finished the lot! No leftovers this time round. 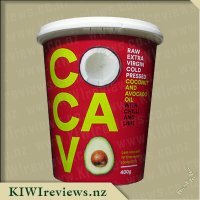 After my success with the sauce, I went on to the Cocavo website to see what other possibilities there might be for using the oil. I was intrigued to find that they recommend stirring some into your coffee to enhance the flavour and make the caffeine fix slower to release. This sounded so bizarre that I just had to try it. I drink my coffee black without sugar (although I have been known to add a shot of rum on a cold evening). Being cautious, I added just a teaspoon of oil - rather less than they recommend on the website - and was suitably surprised. The best way I can think of to describe it is that it is the coffee equivalent of a chai tea latte - spicy and full-flavoured, and very pleasant. I would probably not drink too much at a time because of the richness, but for someone who normally adds full cream milk to their coffee anyway that richness might not be an issue. I am looking forward to trying out some new ways to trial this product. It has a long shelf life but once opened, the product needs to be used within three months. Somehow, I don&apos;t think that will cause any issues. 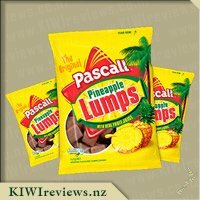 In the beginning some countries got luckier than others and New Zealand more so than most - that&apos;s because we got Pascall Pineapple Lumps. Delicious, chewy pineapple centres, smothered in a chocolate coating. Those other countries can keep their gold, diamonds and oil - we&apos;ve got the most scrumptious National Treasure of them all!